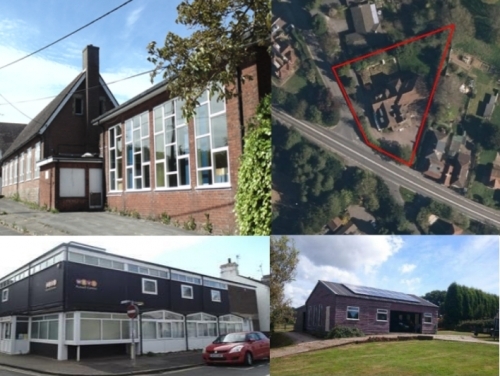 Acting on behalf of East Sussex County Council and the Diocese of Chichester, SHW sold a 1.28 acre surplus site in Robertsbridge – the former Mountfield and Watlington Church of England Primary School to an Educational care provider under the auspices of the National Fostering Agency Group. Marlowe House, in Hadlow Down near Heathfield, operated as a 17 bedroom care home until its closure in 2017. SHW were appointed by RSM Restructuring, and the site was subsequently sold to a private residential developer. The Russell Centre, Eastbourne was sold with prior planning consent on behalf of the Royal Voluntary Service, and will be the site for three new houses. Furthermore, SHW Planning successfully overturned a decision blocking the demolition of stables in Ninfield Road, Bexhill-on-Sea, allowing for the construction of five new detached houses on behalf of Turnbull Land. Montage from top left: Watlington & Mountfield C of E Primary School; aerial shot of Marlowe House, Hadlow Down; Russell Centre, Eastbourne; and Ninfield Road, Bexhill.